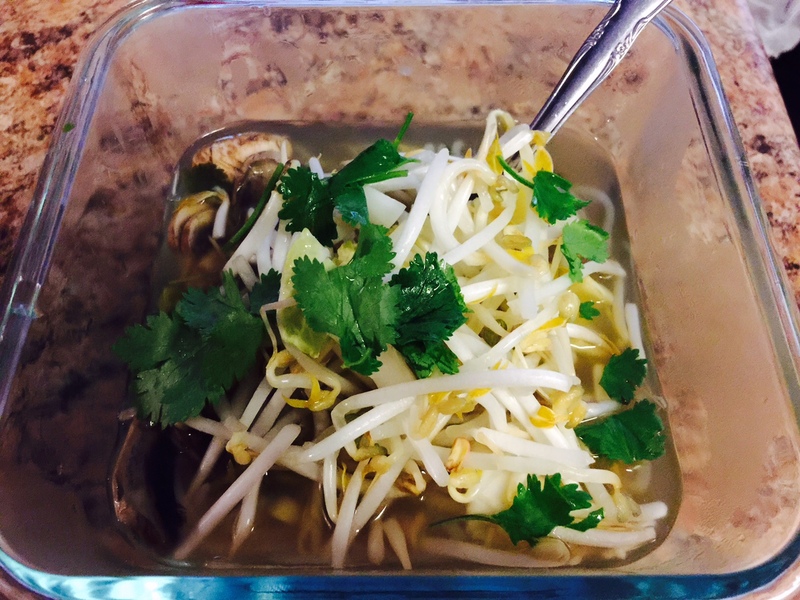 This is a super low fat / carb-free / high protein version of the vietnamese soup known as ‘Pho’. I’ve tweaked it a bit to my own preferences, so please feel free to exclude some of the non-traditional ingredients (ie. mushrooms, bay leaf, garlic) if you like. Hope you enjoy! In a large pot, add the soup broth and water on medium heat as you prepare the next 4 ingredients (onion, garlic, bay leaf, & ginger). Before adding the noodles, use a strainer and rinse them well under running cold water (a good 30 seconds). Add the noodles and mushrooms to the pot. In a small skillet, dry roast the coriander seeds on high heat, until you smell a strong fragrance; then remove from the burner and pour into the large pot. Add half the cilantro bunch into the pot, saving the rest for when you serve the soup (fresh cilantro will be added last), along with the onions. Let simmer for 20-25 minutes. 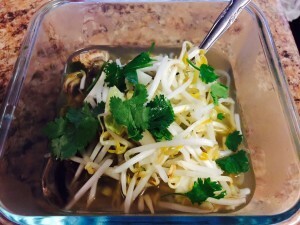 When ready to serve, pour the soup into a large bowl, add the chicken, then place a handful of bean sprouts over top, along with a few cilantro bits. Add soy sauce and hot sauce (optional) for flavour. Enjoy! The only calories are from the chicken, and minimal from soy sauce.